My favourite moment might have been when we were doing a word association game with the entire group of about three dozen people. She said [bɛˑɚ] and encouraged us to shout out responses. I yelled "GAY!" and she had no idea what to make of that. She didn't seem interested when I tried to show her Python, but she immediately took to the Gimp as soon as I showed her it. Weirdly, on one hand she really did not seem to know how to use an actual physical keyboard, almost like she had never seen one before (e.g. she did not know where the return key was), but she intuitively knew how to use the mouse. Where is the return key? Oh, I thought it's the enter key. Some of you may have noticed that I haven't been posting much over the last few days. There is a simple reason for this; I have finally gone up to university. This morning I, along with 122 other freshers, assembled in the hall for this year's matriculation* ceremony at Selwyn College Cambridge. We all wore our college gowns (black with blue facings) over our suits/dresses (I now love British academic dress with all my heart). Upon our name being called out by the head porter, we made our way to the front of the hall, shook hands with the praelector** and signed away our lives in a blank space as indicted by the admissions tutor. Afterwards we made our way outside for the group photograph, showing all the students in the year plus the master, senior tutor, praelector, head porter and chaplain in a single photograph. In the days immediately preceding this I have been overwhelmed by a raft of fresher's events, from services in the chapel to parties in communal college buildings. I have also been amazed at the great diversity of the student body of the college, such as discovering that another of the linguists in college is Tashelhiyt Berber, a historian on my corridor is half-Basque, and finding a great new friend in a mixed-Cantonese/Hokkien natsci*** even in the first couple of days. And this is before I even start my scholarly pursuit of linguistics! That's not to say I've had an entirely positive experience (there have been one or two moments over the weekend where I've felt overcrowded by people, and I've had multiple attacks of imposter syndrome over the last couple of days) but I have managed to overcome each of these in turn, and in spite of these I feel transformed by the last three days. I can only imagine what the next three years hold in store for me. *the process by which students are added to the university register at certain universities, including Oxbridge and Harvard. **a Cambridge specific title referring to those who present students for matriculation and graduation. ***short for natural sciences, Cambridge's highly competitive science degree, combining all three disciplines out of Biology, Physics and Chemistry in the first year before specialisation in later ones. PS: here's a photo of the college I took on Sunday. From left to right are the chapel, master's house and hall. Some of you may have noticed that I haven't been posting much over the last few days. There is a simple reason for this; I have finally gone up to university. This morning I, along with 122 other freshers, assembled in the hall for this year's matriculation* ceremony at Selwyn College Cambridge. Interesting - we did our matriculations as a university (iirc we trooped over there from the college in a group, and back, and had photos in the college, but the ceremony itself was in the Sheldonian; I also don't remember having to sign anything, but maybe I did. I must in some way have sworn an oath not to bring a lighted flame into the Bod, but I've no idea if that was in writing or speech. Actually, I think it may have been a form sent in before the ceremony?). We all wore our college gowns (black with blue facings) over our suits/dresses (I now love British academic dress with all my heart). The gowns are great. Unfortunately, we're then never allowed to wear them in any situation every again. This may be a big reason why people become professional academics, since that's about the only opportunity for wearing them. You particularly have to feel for Scholars/Exhibitioners/etc who get special gowns, but still don't get to wear them ever again..
Congratulations! I suggest you sign up for lots of things, even if you immediately drop out of them. The biggest thing I'd change about my time at uni would be signing up for more things. [I mean, I'd probable do (/not do) the same things today, but that doesn't mean I don't recognise that that's not a good thing...]. And yeah, it's kind of overwhelming, and not always in a good way: suddenly surrounded by hundreds of total strangers, in a strange place, with a variety of cultural and personality difference. And for a lot of people, homesickness will set in in a few weeks too; but it passes. The gowns are great. Unfortunately, we're then never allowed to wear them in any situation every again. This may be a big reason why people become professional academics, since that's about the only opportunity for wearing them. You particularly have to feel for Scholars/Exhibitioners/etc who get special gowns, but still don't get to wear them ever again. 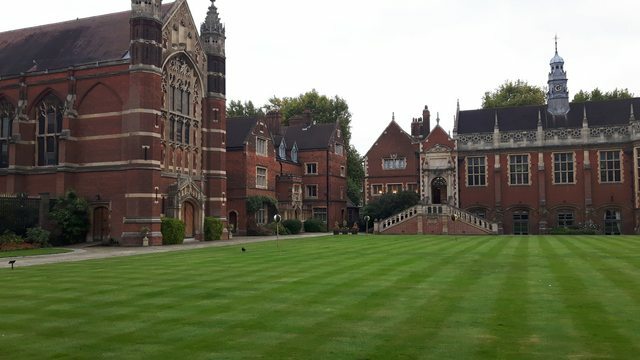 Ah, now that's where our two places appear to differ, because I have to wear my gown if I want to attend formal hall (which at Selwyn is twice a week on tuesdays and thursdays) and I think it's part of my graduation dress as well. Indeed you are correct, but I was thinking in terms of opposition to American-style dress (closed-fronted gowns? nah. And what on earth are those bar things on the sleeves?). And yes the gowns at Cambridge are college-specific (though these differences are only really noticeable for Trinity, Caius and Selwyn), and the sleeves are elbow-length and bell-shaped, though additionally the top seams are left open except at the end, and I have seen one or two people put their arm through the top of the sleeve rather than the hole they're supposed to put it through. I suggest you sign up for lots of things, even if you immediately drop out of them. The biggest thing I'd change about my time at uni would be signing up for more things. [I mean, I'd probable do (/not do) the same things today, but that doesn't mean I don't recognise that that's not a good thing...]. Got through my second CET (comité d'encadrement du thèse) meeting, which means I'm cleared to continue my Ph.D. for the next six months and I can breathe a definite sigh of relief. Also got some very good feedback for things to do and try, so I'm really looking forward to the next experiments and doing lots of quality Science. Equally nice is that I can now book my trip back to the US for Christmas, which I'm kinda already looking forward to. A few days ago, I ordered a CD on Amazon, and I was told that it would be delivered through ColisPrivé. I was miffed, because ColisPrivé is probably the most incompetent delivery company in France (though the competition is fierce). To my surprise, the CD was delivered on time and without a hitch. Partly as a distraction from the awful work I have currently at university yesterday evening I went with many other members of the Cambridge University Guild of Change Ringers to the Thaikhun restaurant across the river from Magdalene, and reminded myself just how much I love Thai cuisine, particularly the green curries. I am really happy with how my IRC client is coming along - while it still could use more features, it is actually quite usable already (e.g. I have been using it to chat on #isharia on SorceryNet) - and getting code I am working on to work properly always makes me happy. I'm friends with a hotel chef. In the year-and-a-half I've known him, he's never cooked for me. So when he called around midday today and was like, "I'm making a Russian dinner, are you free?" I leapt at the chance. plus plenty of vodka and sparkling wine. I may be up all night with indigestion and reflux, but it was worth it. I had to look up "salsify" and "groundcherries" and remind myself that "salsify" is not pronounced as if it meant 'to make into salsa', but that sounds amazing! I think it's my first time ever having salsify. It's become a trendy vegetable lately. I've had groundcherries before, but not this variety. They're marketed here as "goldenberries" and are less tart, which is why they were served at the end as a fruit would be. Now my IRC client has logging and no longer crashes half of the time when you exit - now I just need to implement reconnection, color and text styles, a wider range of server replies, and more CTCP messages. Some years back, I went off celery, not so much on account of the taste as the texture. I find celeriac a superior way to get the same flavour (although lovage--in moderation!--is a good solution, too). It's terrific in soups and is good braised or in a mash when combined with other less pungent root vegetables. I think I'd like to try celeriac sometime. I got history working in my IRC client. Oddly, I don't think of it as tasting of celery, though everyone says it does. I think it's that it's less... sharp?... than celery. More... earthy? I've had it occasionally in pureed form - it's something restaurants like to drizzle onto things to pretend there are vegetables in the dish* - but this week I actually bought one and had roasted celeriac, and it's really nice. Frying's next. *at risk of making this the venting thread: what's with the hatred of vegetables? I get that a restaurant isn't going to be as vegetable-heavy as rustic home cooking can be. But increasingly it seems as though the only 'vegetables' you get are a drizzle of pureed something and two small potatoes, and perhaps some garnish, or shredded/toasted whatever (or possibly pencil sharpenings, it's hard to tell), and then your only non-meat option is to pay £5 for a couple of sad green beans on the side, and another £5 for a "salad" that's just three lettuce leaves. Come on people, the vegetables are meant to be the cheap bit!